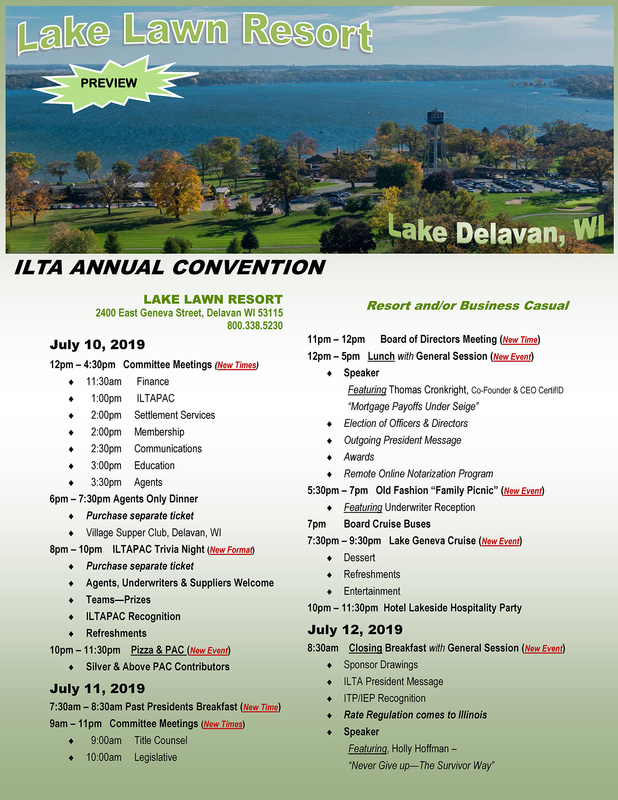 The 2017 ILTA Convention, held at the Lake Lawn Resort in Delavan, WI, was a whirlwind of learning. There were seminars about ALTA’s Homeowners Outreach Program (HOP); legislative activity in IL affecting our industry, and how Blockchain could change our industry. I’ll admit, I don’t quite grasp the concept of Blockchain, but I know more now than I did before and that, my friends, is growth. While it doesn’t always feel like it, we are an ever changing industry. We are changing because of new legislation, new procedures, new technology, and, unfortunately, new frauds. But not everything is new. Our industry faces a nationwide problem, and that problem is finding good people to whom we can pass on our knowledge. We need a way to find those leaders of tomorrow and grow our businesses and our futures. ILTA offers options to help our industry members grow. The first is ILTA’s designation courses, offered for both title and escrow. This program is going on its 5th year. However, the newest avenue for growth that ILTA has created was launched at this year’s convention, ILTA’s Michael D. Troutt Leadership Academy. This foundational event is designed to identify and develop future title industry leaders. The program will help participants grow the skills necessary to be leaders within their company, the industry and ILTA. It will be hosted November 1-2, 2017 at Eaglewood Resort in Itasca, Illinois. The application process is now open. Attendance will be limited to 36 title professionals. Deadline to apply is September 1, 2017. Need based scholarships will be available. Check back for Academy updates. Energy Generated by the Gathering What does it mean to be a leader?